In January or early February of 1983, I was invited to attend a meeting in Glendive concerning the poor fishing at Fort Peck. Steve Schindler from Glasgow gave a presentation and initiated a discussion on forming an organization in eastern Montana for the improvement of warm water fisheries. A group of Glasgow fishermen had come up with this idea earlier in the month and Steve was part of a group that was spreading the word. Glendive formed a chapter that night and I volunteered to be the local secretary. The first informal state meeting was held in Circle in late February, followed by a more official meeting in early April at Glasgow. As a result of this meeting officers were elected or volunteered. Early active chapters of the organization were Glasgow, Glendive, Great Falls, Havre, Malta, Poplar, Sidney, and Wolf Point. The major reasons behind the formation of the organization were the great fishing that North and South Dakota were having. This was the result of the introduction of smelt to Lake Sakakawea in the mid-‘70s, plus an active walleye management program. Fishing remained poor at Fort Peck at this time. Also, in 1982 the federal government decided to get out of the fish hatchery business and turned the hatcheries over to the states if they wanted them. Montana FWP proposed closing the Miles City warm water hatchery but keeping some or all of the trout hatcheries open. There was an attitude within Montana FWP that Fort Peck was too big of a body of water to stock enough walleye fry or fingerlings to make a difference. The Glasgow group felt that FWP was neglecting or at least failing to fully support the potential fishery resource at Fort Peck. An event occurred in the spring of ‘83 which highlighted the importance of the political process. Greg Pauley and Dale Dombrosky traveled to Helena to visit with the fisheries director on the subject of the Fort Peck Fishery and the proposed hatchery closing. The fisheries director’s secretary informed them that he was not interested in meeting with them because he felt there were not enough fishermen in eastern Montana to bother with the issue. (I was not there so I do not know what the direct quote was.) They then went to see Senator Ed Smith and informed him of what had just happened. Within two hours, they—along with Senator Smith—had a meeting with the Montana FWP department head and the fisheries director. All chapters then became involved with their local legislators, with an immediate focus on saving the Miles City Hatchery. There were countless hours of footwork in Helena to get the legislation passed to maintain the hatchery, both by our lobbyists in Helena and members at the local level contacting their individual legislators. The Montana FWP also began walleye egg collections in the spring of 1983. Through trial and error this has become a highly successful program. They initially attempted to collect walleyes from the Lower Yellowstone by shocking and by trapping them in nets at Fort Peck. I personally received phone calls from local fishermen complaining that FWP was shocking all the fish and that they would not bite. Walleyes Unlimited volunteers and the local FWP biologists should be commended for working together. This continues to result in the excellent fishing that we have today. Through the efforts of Walleyes Unlimited, FWP readdressed the forage issue at Fort Peck (and later in other Montana reservoirs). Spottail shiners were obtained from South Dakota. Cisco eggs, obtained from Saskatchewan, hatched and were successfully stocked at Fort Peck. (Montana did not want to stock smelt; the ciscos were likely an afterthought and a concession to not introducing smelt.) 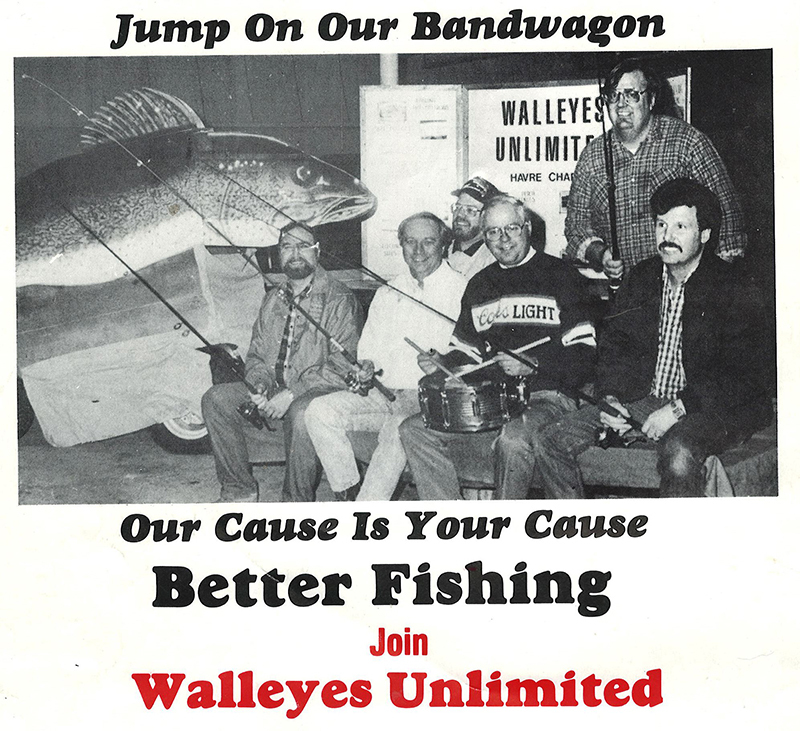 The cisco introduction exceeded our wildest dreams, and by the late ‘80s we were seeing a significant increase in the size of our walleyes at Fort Peck. In 1989, Jerry, Frank, and I attended a state meeting in Great Falls and attended their local banquet. I feel that the Great Falls Chapter should be commended for establishing this event and providing the example for other chapters. The annual banquets remain and will continue to be a major source of our revenue. They also allow the chapters to maintain contact with the community and with non-active members. One statement that I remembered Greg Pauley making when we first started this organization was, “There are people who make things happen, people who let things happen, and people who wonder what happened.” Except for a small group of sportsmen in Glasgow and others who have continued to maintain and expand the organization, we all may still be wondering what happened.